Why did I bother watching? I was sold on the title ... it's so lame that it piqued my curiosity. I wound up very glad that I tuned in! 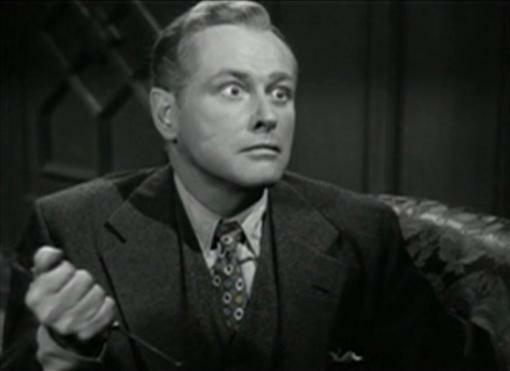 George Macready looking normal enough as Ralph, though Nina Foch's eyes seem to say otherwise. 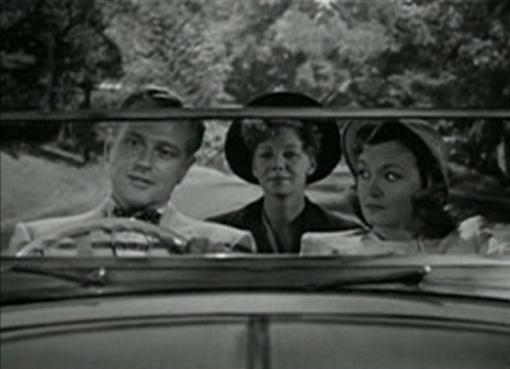 Queenie Leonard observes from the backseat. 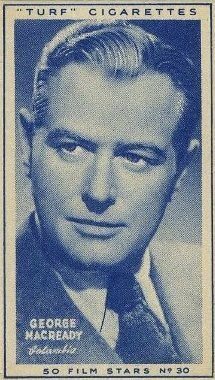 I'm not too familiar with director Joseph L. Lewis beyond Gun Crazy (1950) and Terror in a Texas Town (1958), but to be honest I only knew it was Joseph L. Lewis night on TCM when I originally caught My Name Is Julia Ross because Robert Osborne told me so in his introduction. 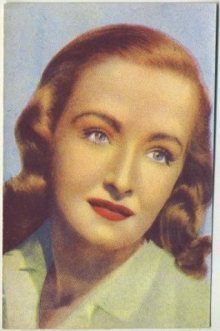 It's an early lead for Nina Foch, whose breakout role wouldn't come until six years later in An American in Paris (1951) and for co-star George Macready it would wrap just one month before work would begin on the Rita Hayworth classic Gilda (1946) in which he plays creepy to an A-plus once more as the mysterious Ballin Mundsen. My Name Is Julia Ross clocks in at just 65 minutes and true to form the pace is quick as we witness Julia's mundane life fall prey to a series of surprises that not only sustain themselves on repeated viewings but are generally enhanced by the film's smaller moments and larger themes, both somewhat overshadowed by the shocks first time through. In the opening we learn that Julia Ross (Foch) is job hunting, behind on her rent and under the impression that her young man was just married to another woman. Things immediately--and at 65 minutes everything's immediate--brighten when she finds an ad in the paper for a new employment agency. She's grilled at the agency by a Miss Sparkes (Anita Bolster) who wants to absolutely confirm Julia's unattached state before offering her an opportunity to interview with a Mrs. Hughes (Dame May Witty). Julia insists that her parents are dead and that she has "no young man." Dead is an interesting word in My Name Is Julia Ross. It seems somehow so bluntly ahead of its time and stands out when it's used on at least three occasions throughout the picture. No euphemisms like passed on or deceased, just dead; they're dead, she's dead, etc. Julia's interview with Mrs. Hughes goes well as she lands the position and while slightly taken aback by the idea agrees to move into the Hughes' home later that evening. Mrs. Hughes even hands her a wad of bills to go shopping with, not a bad start. Julia also meets Mrs. Hughes' son, Ralph (Macready), a handsome young man about her own age with a mellifluous, yet booming voice. However it's during this cordial interview process that we're given our first clue that all is not right when a craggy faced older fellow, who we later find out is called Peters (Leonard Mudie), peers out from a doorway unseen by Julia. Odd. Well it gets even stranger a moment later when Julia departs and we're clued in that something is very wrong with this entire set-up. 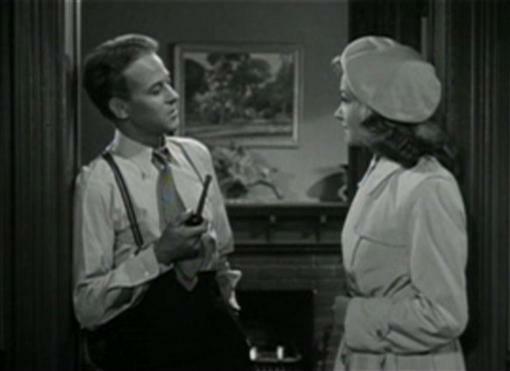 Mrs. Hughes notes to Sparkes that Julia is perfect while Ralph adds that "there's even a small resemblance" before Mrs. Hughes tells Sparkes that she can shut down and disassemble the employment agency now. 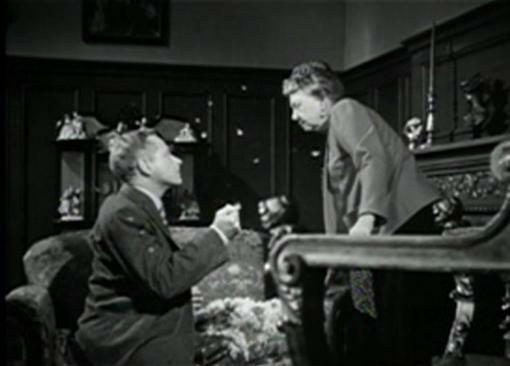 Craggy faced Peters enters the room and Mrs. Hughes asks if Julia spotted him to which he replies in the negative before Mrs. Hughes tells him to keep it that way for now. This gang is up to something! Returning to her apartment Julia bumps into her neighbor Dennis (Roland Varno), who's also the young man she thought she'd lost to the altar. Julia fills in Dennis on her new situation then there's some mutual flirting and a date made for the following evening when Dennis is supposed to stop by Julia's new place of employment to pick her up. With life generally looking up Julia happily heads to the Hughes home where Ralph greets her with his apologies for mother, who's turned in for the night, and his hope that she won't be offended by his showing her to her new room. Ralph stopped tearing at the paper with one of his sharp things to turn slowly towards us in this, the first scary shot of him. The following morning a groggy Julia wakes up in an unfamiliar room which is filled with belongings embroidered with the initials M.H. A happy-go-lucky servant, Alice (Queenie Leonard), enters to wish her a good morning and bring her breakfast. Soon Mrs. Hughes and Ralph appear to wish Marion a good morning. Huh, Marion? Well, that's Julia's reaction too and the confusion only gets worse when Sparkes, the woman from the employment agency, appears in the doorway. 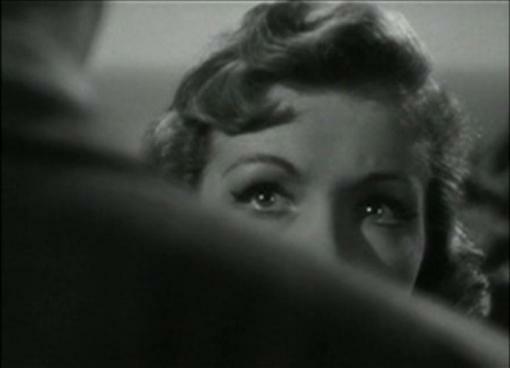 We'll stop right there with the plotting and take a look at some of the more general ideas of My Name Is Julia Ross. Anyway, what I've given you so far ought to really whet your appetite for this one and we're only about twenty minutes in! Ralph only gets creepier which is the only possible result of such clear diction crossed with a fondness for sharp objects. Honestly as My Name Is Julia Ross unfolds Ralph's relationship with Mrs. Hughes felt to me like a peek into Norman Bates' earlier days, you know, when Mrs. Bates was a little more spry. Ralph takes his orders from mother and she's apparently the only one who can tell him what to do, though you get the general idea that that's a rubber band that is going to snap one of these days. 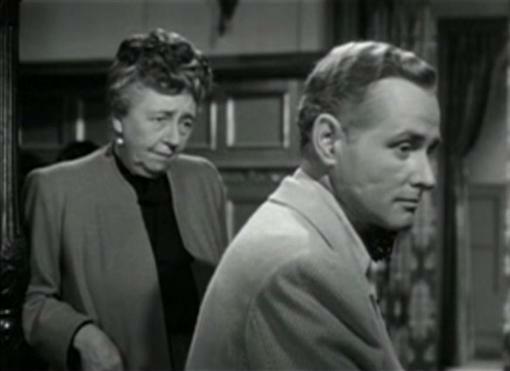 When the mother-son duo's plotting graduates to a more direct plan of murder it's Mrs. Hughes who mentions losing her nerve to which Ralph derisively responds, "Who's the weak one now?" As to Julia's captive situation it's interesting to watch develop as it's not handled in the usual way. I had this idea that perhaps the Hughes' would attempt to brainwash Julia into believing she really was this Marion. Not so. Julia is aware of who she is from the very first moment she wakes up, transported from one bed to another, and she never relents in insisting that she is Julia Ross. The trouble is that the more she insists, and this is especially true in those scenes involving outsiders such as the servant Alice or a visiting parishioner and his family, the more troubled she sounds. Mrs. Hughes and Ralph, just by sticking to their story that Julia is disturbed, and seeming so normal themselves while doing so, are only helped by any contrary action by Julia, who just digs herself deeper and deeper through her insistence that she's being held captive. Dame May Whitty is her fantastic usual self as Mrs. Hughes while George Macready is absolutely outstanding as the terrifying Ralph. 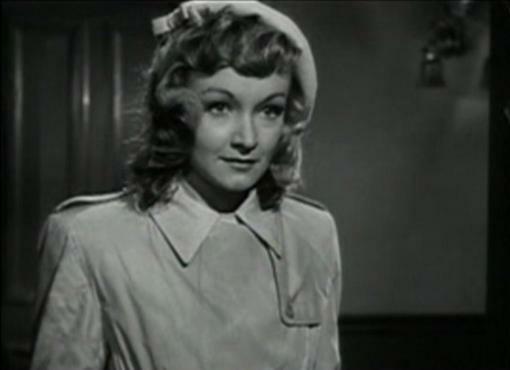 I could go either way on Nina Foch. To be honest she seemed replaceable to me though at the same time she is a pleasant enough heroine to hitch our emotions to for an hour plus. Her Julia Ross is defiant, even courageous, while capable of ratcheting the viewer into a panic over the growing hopelessness of her situation. So maybe I'm being a bit rough in my doubts over Foch, but I couldn't imagine another Ralph after being given the shivers by Macready. No explanation needed to enforce his convincing portrayal of a psychopath. Roland Varno's Dennis got on my nerves a little though mostly by distracting me from the story by leaving me to puzzle over where his subtly different accent originated from (Varno was born in The Netherlands, so I guess that's my answer). Varno does do well in the one series of scenes which really matter for his character as he attempts to find out where Julia has gone after missing their date. Doris Lloyd doesn't have much to do as Mrs. Mackie, the landlord at Julia's original apartment. It is interesting to see the contrast of the two domestic workers, the duplicitious Bertha (Joy Harington) at Mrs. Mackies's versus the kind-hearted Alice at Mrs. Hughes'. Both actresses earn laughs through very different personalities. Low expectations, ha, I went in with no expectations, and I loved it so much that I've since watched it twice more since that mind-blowing first impression. The wrapper is torn off, My Name Is Julia Ross will never again be as fresh for me as it was that first time, but after these repeated viewings it continues to sustain itself largely through Macready's performance and the fast-moving story which often seemed to me 15-20 years ahead of its time. Totally agree about this movie-a real surprise that was only supposed to be a B-movie.Macready is awesome!Nina Foch laughed that she found it hysterical/bizarre George as Dame May’s son,but he was spookier than most any other actor could’ve been in the part.Think he was underappreciated,and someone should write a book about someone I find fascinating. Thanks for commenting, Ellen. Totally surpassed expectations, right? So many gems out there for us to uncover, but I recall it being especially fun to write about this one immediately after I first saw it. Macready very creepy! 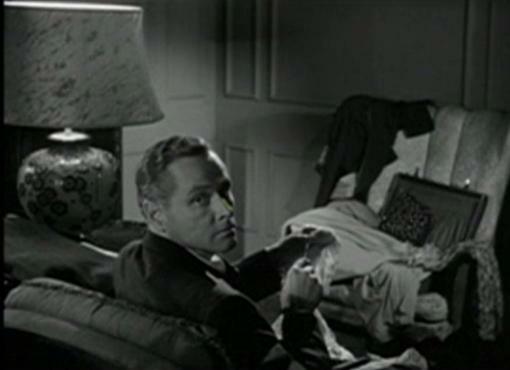 Wondered if anyone else was in the movie at times.Love his running down to finish off Julia,and his attempted escape from Scotland Yard.Also,Macready in The Missing Juror is about as creepy-that steamroom scene is something else!Mazurki with his hands on his throat.Agree,Nina could’ve been replaceable,but she seemed to get on with costars.Have Columbia Noir Collection,she & George playing dueling harmonicas-funny for someone who was “an icicle”,as many of his characterizations were called. Apparently,George trained to be a concert pianist for many years until his father demanded he study engineering.Glad George pursued his dream of being an actor,encouraged by Richard Boleslawski.He was afraid his facial scars (one very pronounced one on his upper lip,as well as across his cheek and around the jawline-can imagine must have other scars,too).Still find him very attractive,and an excellent actor who always seemed to it his all!